Nearly 70 percent of Learning and Development (L&D) teams report feeling pressure from leadership to measure learning’s impact, according to an annual survey by LEO Learning and Watershed. This year’s results show a 38 percent increase from respondents who strongly agree there is pressure to measure compared to 2018. The survey found that 96 percent of respondents want to measure learning’s impact, but only 50 percent are evaluating learning based on ROI, job performance and organizational impact. An increasing amount of respondents (28 percent) report not knowing how to get started when it comes to learning measurement. LEO Learning and Watershed have found that a big data approach is key to solving the challenges around measuring the business impact of learning. This is done by collecting as much data as possible and looking for patterns, rather than hoping to make concrete connections with limited data sets. When it comes to the use of learning data to deliver personalized learning, the survey found 86 percent of L&D teams want to use learning data to deliver personalized learning, but only 21 percent are doing this now. Nearly 40 percent report not knowing how to get started or what tools to use. Download the report to see the full results. LEO Learning has a deep understanding of learning design and technology, and pioneering creative approach, necessary to drive learning transformation. Founded in Nashville, Tenn., in 2016, Watershed is dedicated to changing the world of learning by helping corporate L&D departments get more from their initiatives. This includes a customizable SaaS-based learning analytics platform that assesses the impact and effectiveness of corporate learning programs and helps maximize investments in learning. Made possible by xAPI, Watershed enables users to explore their learning data in one place and measure how L&D programs impact their organizations. Since its founding, this young, high-growth organization has developed a portfolio of Fortune 500 global clients—such as Visa, Verizon, PricewaterhouseCoopers, Caterpillar, and more. 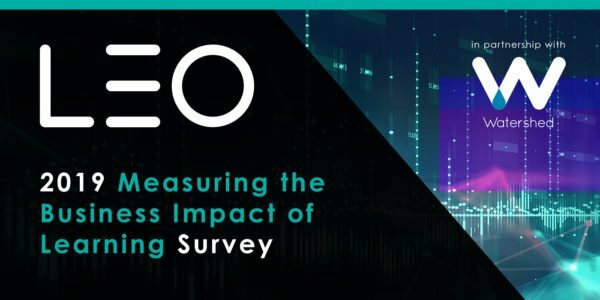 “The survey results confirm that the pressure to measure isn’t going away,” said Piers Lea, Chief Strategy Officer at LEO Learning.